Children can have a difficult time understanding their emotions and the way certain events make them feel in the early years of life. As educators and parents it is our responsibility to help and support them to manage their emerging and often confusing emotions. Recognising emotional responses in our own bodies is a learned skill and takes time and lots of practice! 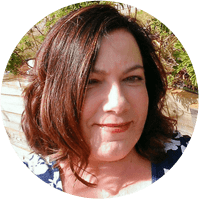 Even as adults, knowing how to understand and manage our emotions can be difficult and we have all been guilty at some stage of not handling things the way we would have liked to in hindsight. So imagine how difficult it must be for young children who are often yet to even name the emotions they might be displaying! Behaviour is one way children show their emotions and obviously their behaviour and actions are not always acceptable in the community around them. So how do we help them to find their way through this emotional journey of discovery? It is important to realise that as educators (and/or parents) our response to their behaviour and emotional displays is important and can in fact shape the way they learn to recognise, display and control their emotions and feelings. So what can you do? I’ve got you covered! 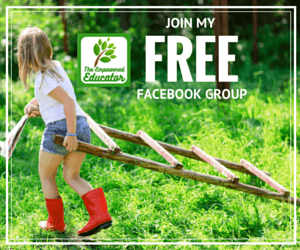 I’m going to share 10 of my favourite strategies and 10 activity ideas with you so that you can help the children in your care express and manage their emotions. If you get to the end of the list I’ve also included a few printables for you to use in your programming. Let’s get started! 10 Strategies to help young children express and manage their emotions. 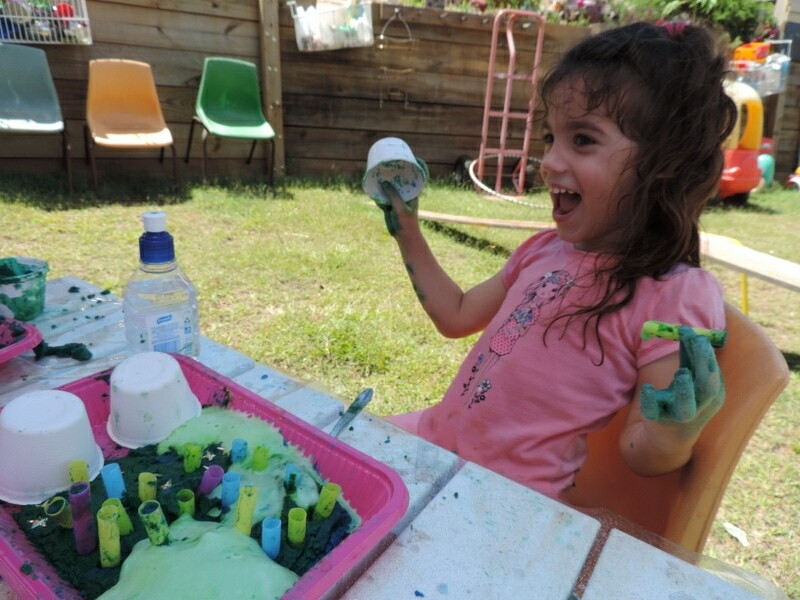 Messy Play Opportunities – Ensure that you provide lots of opportunities for messy play both inside and out to allow children a way to express their feelings , work out their possible frustration and anger as well as to provide a calming experience as they use their senses to explore and play. Model appropriately – Be aware of your own behaviour and model appropriate emotional expression and conversations. We know that children learn by watching us so make sure you are showing them what they need to see to form their own regulatory behaviours. Listen before Talking – Listen when a child is expressing anger or distress – try not to immediately jump in and offer solutions to the scenario that has occurred and made them feel this way – feeling heard and understood can be an important road to recognising and naming what they are experiencing. Build an Activity Kit – Use simple ‘calm down’ activities to help children move from a stressed or frustrated state to a calmer more receptive and positive state. See the list below for some easy ideas you can try. Build Quiet Spaces – Ensure your indoor and outdoor environments have quiet spaces that children can go to if they feel a need for some time alone or to just process their current feelings. You might include some soft cushions, stories, calm down jars, drawing materials, puppets, dolls to allow them to work through their feelings using play props. Use Questions – Use open ended questions when you can to help children express what they are feeling as they are participating in an activity. Use Reflection – Make sure you are noticing and reflecting both the positive and negative emotions children are displaying as they need help to understand both.Try to reflect back to a child the emotion they are displaying and give it a label – help them to recognise and name what they are feeling. 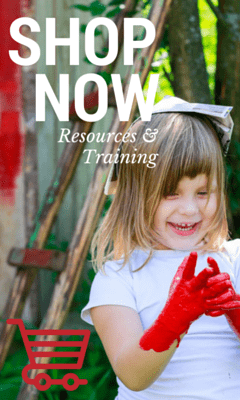 Build a Vocabulary – Use activities and conversations to help children build a growing vocabulary of feeling words and how to use them to name their own emotions. Ensure they regularly hear you naming the emotion they are displaying. Use Facial Expression – Communicate on eye level with all children and show them how your own face looks when you feel different emotions. Give Recognition – Praise children specifically when they use emotional labels to talk to their friends or other educators. Explain to them and nearby children how using words helps those people around them to know exactly how they are feeling which is why you are so proud of them. Read Books – Make sure you build a quality collection of stories that explore themes around labelling and displaying emotions. Talk about what’s happening as you read, ask questions and find ways to get the children actively participating in the story you are reading. Use Painting & Drawing Expression – Show children cards with faces showing different emotions (Free printable for you to make your own below) and ask them to think about what might have happened to make the person feel that way. Can they draw a picture? Can they paint a picture that shows how they are feeling at the moment? Use Natural Materials – I recently made some pebbles for the children to build their own faces with. Simply cut out different mouths, noses, eyebrows from a magazine, glue to smooth pebbles with a watered down PVA mix and then add again over the top to seal. 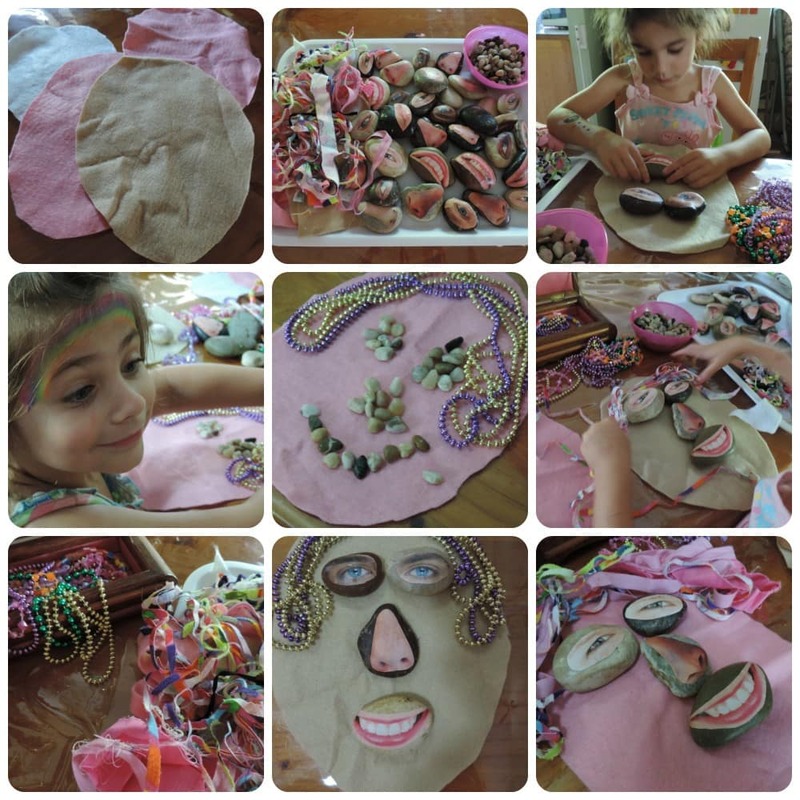 When dry the children can use them to build different facial features. talk about the face they have put together and what emotion the face might be showing everyone. I added some material and wool scraps for the children to use as hair . 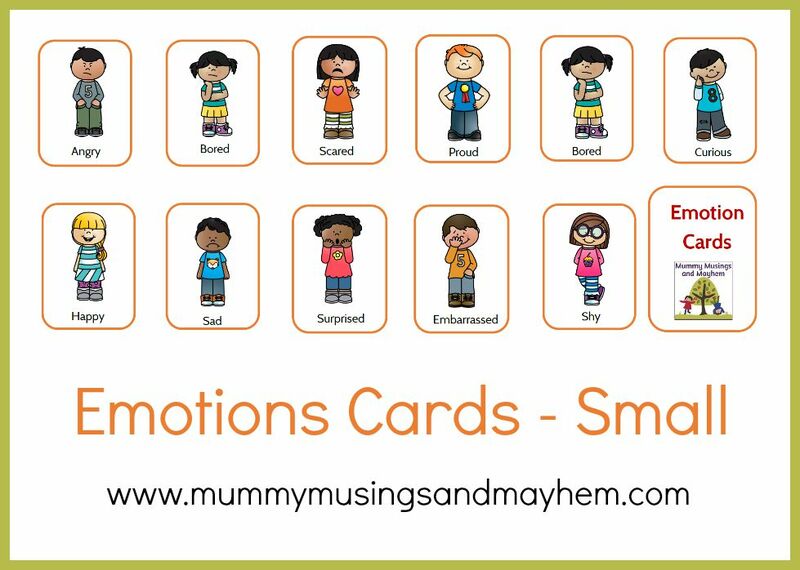 Play Games – Use my free printable cards to play a game of ‘Emotion Snap’ or ‘Emotion Memory’. Simple print two copies of the card for a memory game or 4 to play a snap game. Prompt dicsussion by asking children what emotion each card they have turned over (or snapped) shows. Use Photos – Take photos of the children using their faces and body language to express different emotions – label each photo, laminate and display where the children can see them easily as they play. Every now and then ask a child to point to the photo of themselves that matches how they are feeling at the moment. It can be easier for children to recognise and label emotions when looking at their own face. Make Calm Down Bottles – These work very well for younger children and give them some time to stop and calm themselves as they explore the bottle and the treasures within. There are lots of examples to explore on Pinterest but all you need to do for a very basic version is recycle some clean water or juice bottles, add water or hair gel, some sparkly bits and pieces or small objects reflecting current interests and glue the lids on securely. Let the children roll them, shake them and turn them upside down. They will be fascinated by the contents moving slowly in the bottle. Go Fishing – Add paperclips to my small printable cards, collect a stick from outside (or use some dowel or a wooden spoon), tie some fishing line or cord to the stick and tape a small magnet or magnetic wand to the cord. Spread the cards out on the floor face up and let the children go fishing! There are many ways you can play this depending on the ages of the children but they might ‘Try and catch a happy/sad/grumpy face’ or ‘Catch a face that shows how you are feeling today’ – I’m sure you can come up with many other ideas to extend the activity and help the children to label each emotion. 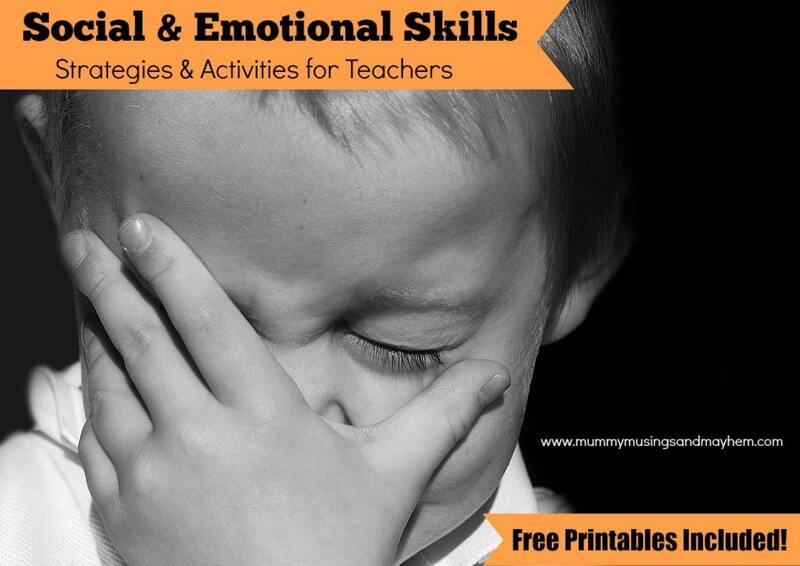 Encourage Dramatic Play – Lie the emotion cards face down on the table or mat – children take it in turns to pick up a card, tell everyone what emotion the card is showing and then act out that emotion. For example they might put a big smile on their face and a happy dance around to show ‘happy’. To extend this activity and talk more about feelings you could try asking the children what they think might have happened to make the child on the card feel that way. There might be many similar ideas or lots of different ones, try and explore them all and use as way to better understand what makes the children in your care feel the way they do. Provide puppets and soft toys for children to explore emotions, real life scenarios and role play with as they put on shows or create small worlds. 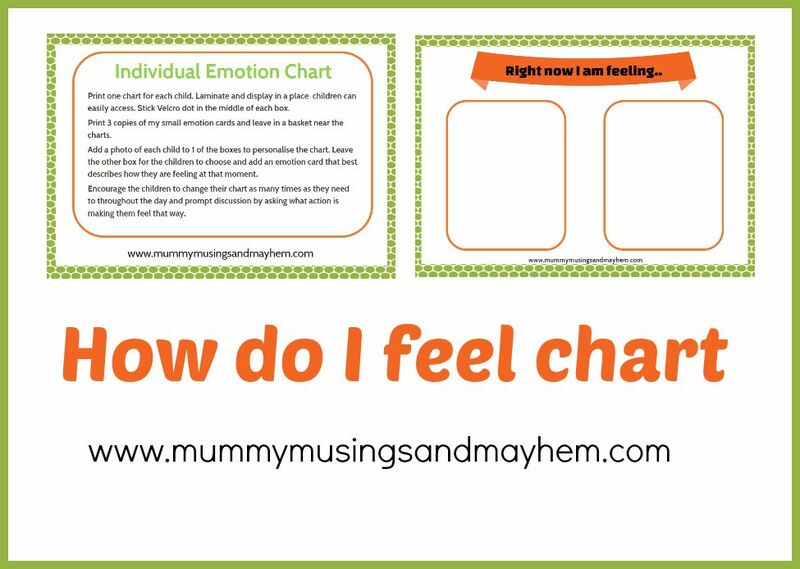 Daily Chart – Introduce a class or group routine each morning (and again in the afternoon) for children to have the opportunity to share how they are feeling that day on their own feelings wall chart. I have included a small template for you but it would be easy to make a larger version to fit bigger photos if you choose. 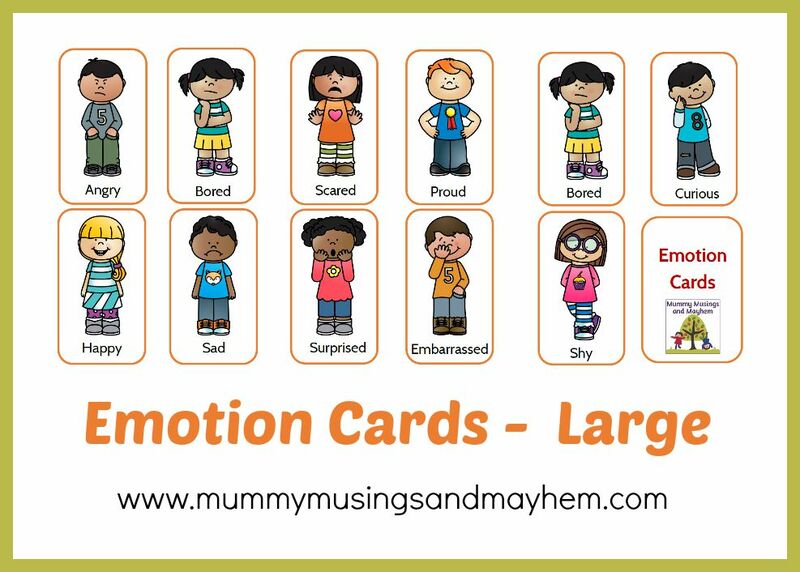 Use the small emotion cards with a velcro dot on the back to attach to each child’s laminated chart. Obviously you will need to print multiple copies of the cards as you might have many children feeling the same emotion. Leave the charts somewhere that is accessible throughout the day and encourage children to change their cards if they feel they need to express a different feeling. If you would like to use my printable cards and daily chart template you can click the button below to download. Simply print and laminate! I’d love to hear how you have used them! Thank you for these wonderful ideas I will use then in my class next year. Im sure ill get great results. 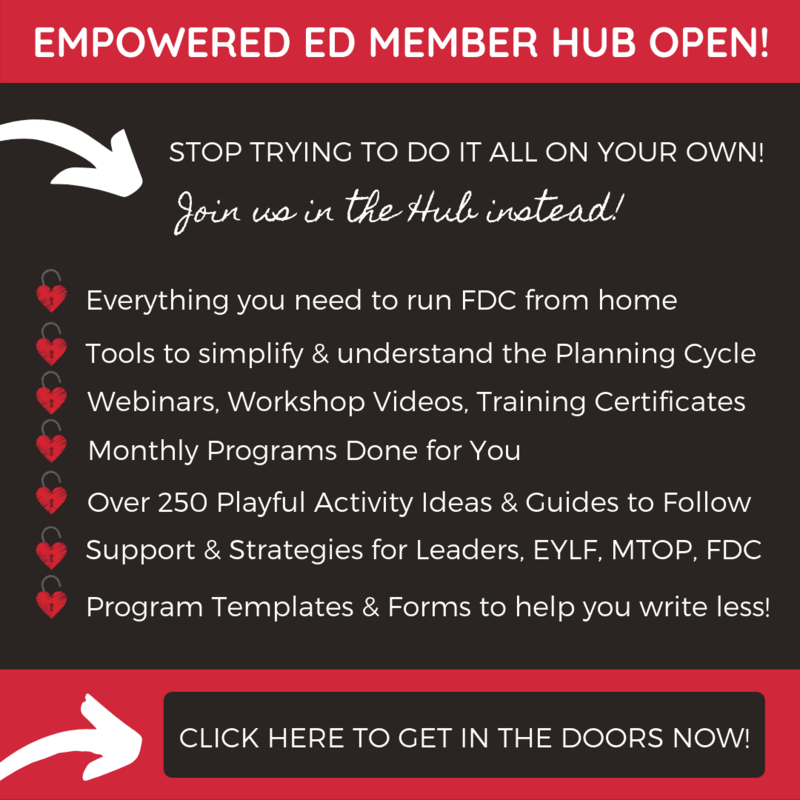 Wow, this is wonderful article summarizing so many great tips! It´s very important for children to notice their emotions and work with them. Thank you a lot! Hello, thank you for your lovely ideas. In England, it is Children’s Mental Health week and I will be using your ideas and cards in a circle time today to help children think about how they are feeling.
. It is a nice thought that your work has travelled…………….J.